Harbour Hideaway in Ilfracombe, Devon sleeps 6 people. Harbour Hideaway in Ilfracombe is tucked away in the old side streets around Ilfracombe’s popular and pretty harbour. 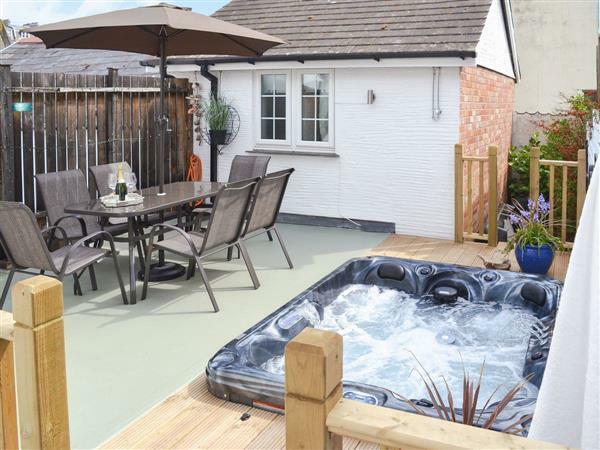 The original parts of this detached fisherman’s cottage date back to circa 1750, but the cottage has been lovingly converted to be a comfortable hideaway with the added bonus of its own private hot tub. 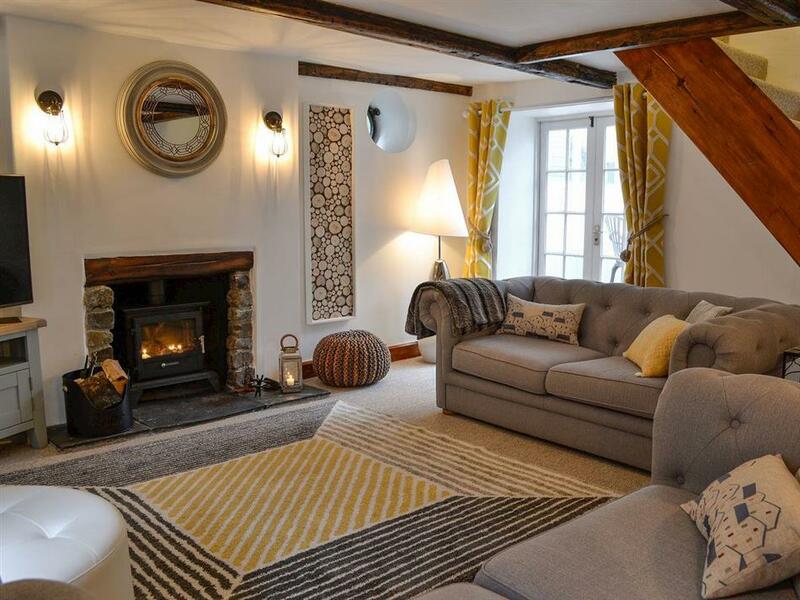 Stylish furnishings along with a multi-fuel burner, oak beams and partly exposed stone walls make it a cosy retreat in cooler months. Located a short walk from both the harbour and town centre, the cottage has much to offer guests during their stay. There is a large range of pubs, Michelin star restaurants and shops to choose from around Ilfracombe’s centre, whilst the famous Tunnels Beaches is just around the corner. A short walk away is Ilfracombe’s harbour area, with its quayside, lifeboat station, church overlooking the Bristol Channel and not forgetting the much talked about ’Verity’ sculpture by Damien Hurst. This is a retreat perfect for families and groups of friends but also makes an idyllic love nest for two. There are numerous attractions within easy reach of the house, including the Combe Martin Wildlife and Dinosaur Park, Watermouth Castle and the Lynton to Lynmouth Cliff Railway. At Croyde and Woolacombe, you will find some of the best and cleanest surf beaches in the country, as well as many smaller coves and bays. Exmoor and the South West Coast Path are located close by, and on a clear day the views can be spectacular of the surrounding coast and countryside from these well-known walking areas. There are National Trust properties at Arlington and Knightshayes, and the RHS gardens at Rosemoor in Great Torrington. The beach is 200 yards from Harbour Hideaway in Ilfracombe. With the shop, pub and restaurant 50 yards from Harbour Hideaway. Living room: With multi-fuel burner, 49 Sky Smart TV (basic package), DVD player, Blu-ray player, iPod dock, CD player, Playstation 3, double sofa bed (for flexible sleeping arrangements), beams and French doors leading to conservatory then onto courtyard garden and roof terrace. Bedroom 1: Accessed by first staircase with double bed, Freeview TV, beams, vaulted ceiling and en-suite with shower cubicle, toilet and heated towel rail. Bedroom 2: Accessed by second staircase with twin beds, Freeview TV, DVD player and French doors leading to roof terrace. Bedroom 3: Accessed by second staircase with king-size bed, Freeview TV, beams, vaulted ceiling and en-suite with shower cubicle, toilet and heated towel rail. Gas central heating, electricity, bed linen, towels and Wi-Fi included. Initial logs for multi-fuel burner included. Stairgate. Welcome pack. Enclosed courtyard with sitting-out area and garden furniture. Hot tub (private). Parking permit for 1 car included; additional on road parking. No smoking. Holidays at Harbour Hideaway run from Friday to Friday. For a better idea of where Harbour Hideaway is, you can see Harbour Hideaway on the map below. Harbour Hideaway is in Devon; should you be on the lookout for a special offer, you can find all the special offers in Devon. It's always worth checking to see what is on offer at the moment. Do you want to holiday near Harbour Hideaway (UKC2840), you can see other cottages within 25 miles of Harbour Hideaway; have a look to find your perfect holiday location.